Oil prices set some multi-year highs yesterday afternoon, with Brent closing at $81.20, the first close above $80/bbl since November 2014. Oil markets are feeling the pressure of Iran sanctions, particularly in areas reliant on Middle Eastern oil. While not quite at record highs, WTI did manage to close above $72/bbl for the first time since July. This morning, WTI crude is up even higher, trading at $72.04, a gain of 32 cents. Fuel prices are also in the black after some big gains yesterday. Diesel picked up a whopping 6 cents yesterday while gasoline rose “just” 3.7 cents. This morning, both prices are heading higher. Diesel is currently trading at $2.3002, a gain of 1.4 cents. Gasoline is at $2.0644, picking up 1.0 cents. Oil markets continue to rise following OPEC’s weekend statement which fell short of committing to a production increase. The organization said they would increase production only in response to customers asking for more product – something difficult to verify. Now forecasters are beginning to raise their expectations for the year. Some are pointing towards $100/bbl in 2019 as sanctions clamp down on supply. Merrill Lynch upped its 2019 crude forecast to $80, up $5 from the previous forecast, and sees potential to hit $90 or higher by Q2 2019. With crude oil prices hitting a 4-year high, it’s time to consider a fixed fuel price strategy to manage risk. To learn what Mansfield offers, download our brochure. Three possible storms remain in the Atlantic with the potential to impact the US. Invest 98, which includes some remnant moisture from Florence, is doubling back towards North Carolina. Although the system is expected to bring maximum rainfalls of 1 inch, the additional rain hitting already flooded areas could exacerbate current conditions. For that reason, Mansfield remains on Code Orange for South Carolina, North Carolina, and Virginia. Further out in the Atlantic, the storm formerly known as Kirk has died down to a sub-tropical storm. 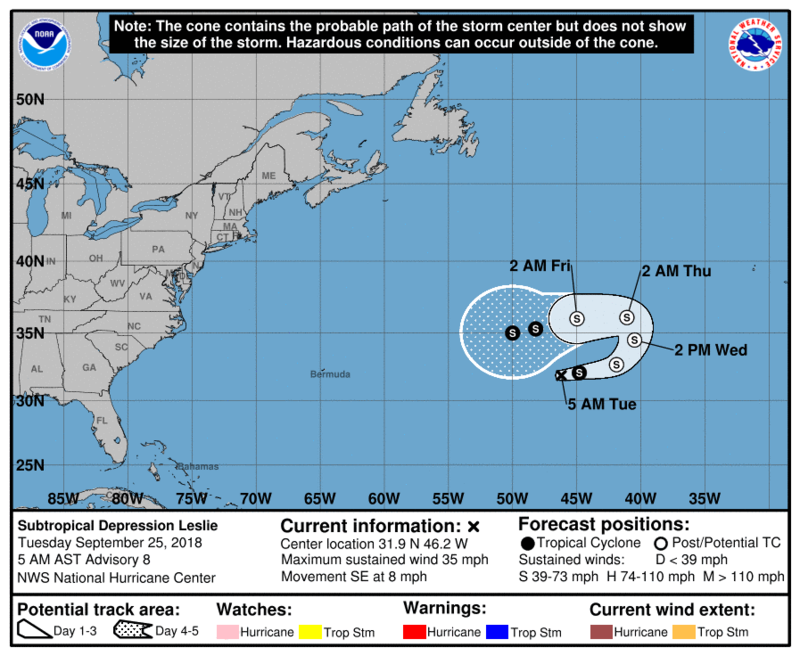 The system has the potential to strengthen into a named storm once again, but current forecasts show it remaining disorganized over the coming week. The third storm is one that’s slipped under the radar for a while. 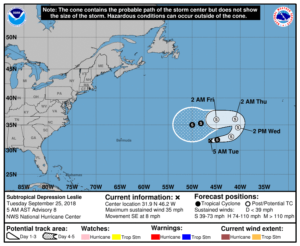 Subtropical Depression Leslie, sitting high in the Atlantic, is showing a high probability of forming into a storm in the coming days. The storm’s direction has turned from heading directionally towards Europe, to now facing the US. Whether the storm will continue spinning or straighten out is yet to be seen. Mansfield will continue monitoring all storm conditions and will report relevant updates.